Interfold V Fold Hand Towels 2ply White 3150’s. Dissolvable & Flushable Paper hand towels that are soft and strong enought to dry your hands with the added comfort of Papernet’s Superior quality pure tissue paper. 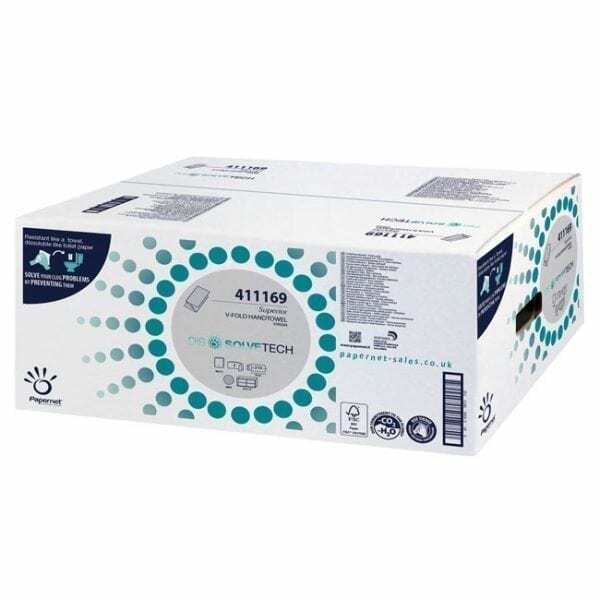 Papernet Dissolvetech, THE RAPID DISSOLVING TISSUE to Reduce the risk of cloggings. Papernet Dissolvetech is so different from flushable hand towels that simply break down in water with the aid of toilet flushing. Every year, more than 50% of companies frequently suffer problems and consequences associated with pipe blockages. Recent examples of research have shown that the cost of solving these problems exceeds EUR 1 billion in Europe, considering the use of chemical additives and special maintenance work. Papernet solves the problem with a range of products made with a special temporary wet resistance; a technological solution which ensures that the tissue offers excellent performance during use and dissolves quickly in contact with water. Recommended washroom and kitchen areas to use your Papernet Dissolvetech Interfold Hand Towels? As many areas of any workplace offer paper hand towels it is important for us and you to offer consistant quality and knowing that certain environments has issues with paper hand towels goind down the toilet causing blockages. Nursing & Care Homes and Schools are at the top of this list. With our Dissolvable towels that will become a problem of the past. Trains and Aeroplanes also use flushable paper hand towels and this dissolvetech tissue is a perfect replacement. See it for yourself. Get in touch via our contact form or call 0151 342 2111 if you would like to see a sample of our flushable and dissolveable towel. You can see a further range of Papernet Tissue products here. Part of the Papernet Superior range with a range pattern. Download our Spec sheet here for our Papernet Dissolvetech Interfold Hand Towels.